When in China Town walking past the restaurants with strings of red glistening pork, it is quite hard to resist. Char Siu is so yummy, sweet and savoury. Commercial char siu always use red colouring. For homemade recipe I always avoid colouring and msg. 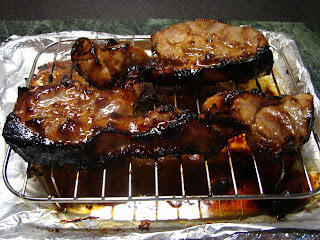 This is my version of char siu recipe, I prefer to use char siu sauce with other ingredients as the marinate. I do use hoi sin when I run out of char siu sauce but it is quite salty and make the char siu quite dark. Take the meat out for about 1 - 2 hours to warm. Put the meat on a rack. Roast at 210deg C or grill at 190 -180 deg C (about 30 - 40 minutes or till brown all over) turn over at half time. Mix honey with a little of the fat and juice from the roasting tray and brush all over the meat. *Once the meat has been marinating over 24 hours, the meat will be juicy and pinkish like it has been cured with cured salt. 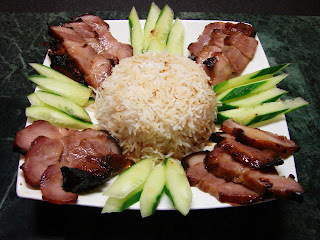 Which was then tranformed into char siu rice with cucumber and sauce on the roasting tray drizzled over the rice. Put everything in a saucepan and heat till hot and thickened. 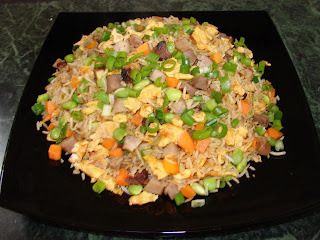 Next day I had char siu fried rice for lunch. Other than char siu, there are overnight rice, garlic, carrot, pea, egg, spring onion flavoured with light soy sauce, ground pepper and dash of sesame oil.